In rain, and with the flowerlets slept. Before Thy throne to sing. A sturdy and relentless theology of Creation, aka cosmology, is crucial right now. We need to stop arguing differences, to appreciate both diversity AND the wholeness of God’s creating. We need to do this in order to collaborate to save our one small unit of divine cosmic creativity. Such a perspective has been present in the Celtic tradition for centuries, as the above prayer illuminates. Hearing the Creation story in Genesis always gives me a spiritual boost. It’s majestic, bold, and grand—a poem of overwhelming inclusivity and diversity. We pay lip service to diversity, yet it terrifies us. Still, God potentiated all this Wonder, culminating in beings made in the divine image—humanity. BUT . . . did Godde create a hierarchy of being? Humanity immediately fell prey to such a notion and acted on it—men at the top, of course. All religions downsized Creation's wholeness and rank-ordered humanity and all other matter for the sake of power and control. Some things good and others bad. God's idea was that ALL of it was GOOD. This can't be said enough. Later in my studies I fell in love with Irenaeus of Lyons’s famous saying: “The glory of God is the human person fully alive.” I had that phrase calligraphed on the invitation to my ordination to the priesthood. I still believe it, but thanks in part to the biblical Job I have a new vision. When the faithful Job lost everything he had, except his insistent faith, he prayed—harangued—Godde to answer for the excess of calamity on such a faithful servant. God, more patient than the impatient Job, finally appeared to Job and walked him through the whole of Creation. Once again awed, I learned that divine creativity was boundless—and ALL of it is the glory of God. Jesus the Christ preached Love, period. This embrace includes ALL creation. Jesus might be horrified at how exclusive Christians have made his name. The work of Jewish scholars, like Dr. Amy-Jill Levine, is essential to make us aware that we Christians do not need to buy into anti-Jewish translations of scripture, or Christian chauvinism, in order to assure the uniqueness of our Jesus. As I approach my ninth decade, my body warns, “maybe not” while my mind says, “yes you can!” I slow down, take time to observe as much as I can. I relish the small things more than ever—all good, all Glory, all God. -A tiny ant makes its way along the edge of my home altar, stopping occasionally to wave its sensory antennae before it crawls up to join Jesus on the cross—a wise and foolish ant. -A small boy speeds on his scooter down the hill in the playground; he is thrilled; his dad sees he will be unable to stop before he reaches the edge of the trafficked road ahead. Dad dashes. -A baby in church practices her newly discovered extended squeal—a siren of praise. 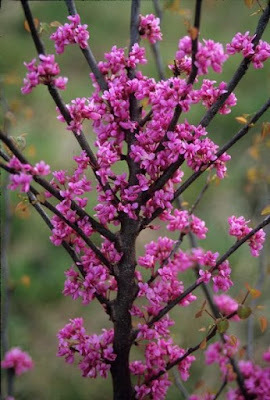 -The redbud tree in our yard bursts into bloom, its bare branches popping with dark pink blossoms. They weren’t there yesterday. Godde, save us from exceptionalism: Christian, human, even American. Glorificamus Te for the whole shebang.